The Arabian Scorpion followed the image of the scorpion defined by the Sumerians more than 3000 years ago. The Scorpion was well-defined with Two Claws, a Head (Crown), a Heart with its Aorta, Segments, a Raised Tail and a Sting. 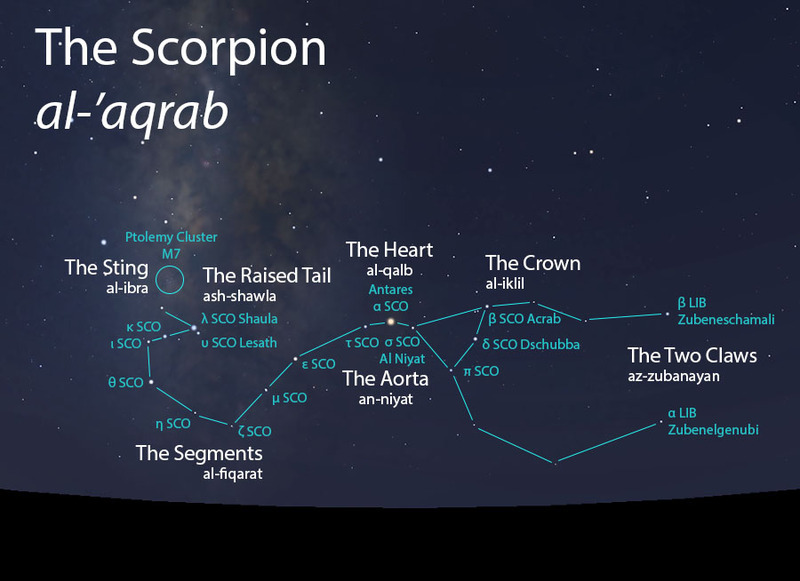 The Scorpion (al-‘aqrab) as it appears setting in the west about 45 minutes before sunrise in mid-May. Sky simulations made with Stellarium. The Scorpion is an easy recognizable constellation that is largely consistent with modern-day Scorpius. In the west, its Claws extend into Libra, just as it was drawn in Mesopotamia thousands of years ago. The entire Scorpion, from its Two Claws to its Raised Tail and Sting set within a short period of a few weeks but rise over the course of almost two months. Today we can expect to observe the Scorpion setting in the west (about 45-60 minutes before sunrise) from late May through mid-June, as seen from the latitude of Tucson. Likewise, it rose from late November through mid-January. The Scorpion does not figure in the calendar of the rains stars. The celestial complex of the Scorpion comprises four lunar stations. The earliest listings of the lunar stations were later adjusted backwards by two stations to adjust the calendar to begin with the vernal equinox. In what follows below, the earlier order is listed in parentheses.